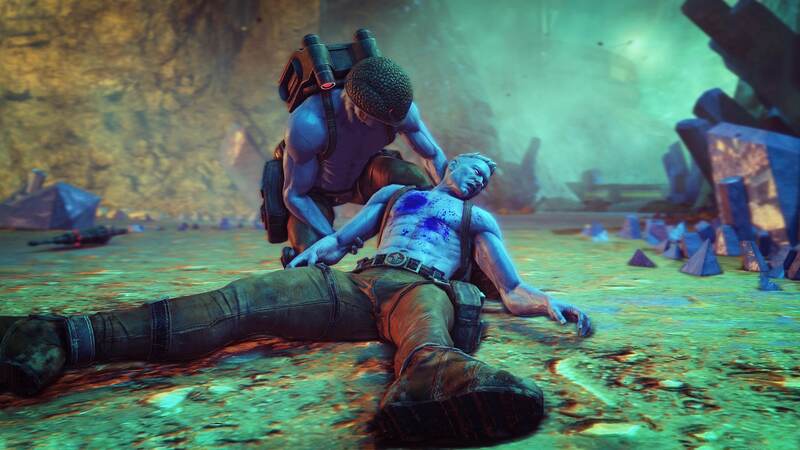 Rogue is back in Rogue Trooper Redux… and almost nothing has changed. For those who don’t know the character from the 2000AD comic anthology series, he’s a GI – a Genetic Infantryman, born in a test tube and bred to fight in an endless war on Nu Earth alongside his army of fellow clones. Like all GI’s, he’s stronger, faster and more deadly than any human, and can breathe normally in a chemically toxic environment. But when his entire platoon is slaughtered and Rogue learns that they were betrayed by the Traitor General, he goes AWOL in pursuit of justice… and vengeance. Rogue isn’t exactly alone in his quest either, as three of his fallen comrades’ personalities and abilities are kept on biochips inserted into his helmet, backpack and rifle. Helm, the helmet, can scan for enemies and hack terminals, as well as project a hologram of Rogue as a decoy against enemies. Bagman, the backpack, can scavenge various materials on the battlefield, turning them into medpacks and an assortment of upgraded weapons. Gunnar, the rifle, can switch from rapid-fire machine gun to sniper rifle instantly, as well as becoming an independent sentry gun which can be used for protection or as a distraction. Each has a distinctive personality and are as likely to bicker with each other as they are to offer helpful comments, which adds to the fun. It’s a simple but effective plot which has worked in comic books for decades and, in 2006, Rebellion Developments (who own 2000AD) unleashed their Rogue Trooper game upon the world. It wasn’t the first to feature the character but it was easily the best, and it received a couple of BAFTA game nominations. It had some flaws, but it perfectly captured the look and nature of the comic books and was surprisingly fun to play. Now, eleven years and several console generations later, that original game has received a makeover and has been brought back to fight the good fight once more. Unfortunately, a fancy new coat of paint doesn’t change the fact that this game is eleven years old and feels like it. Other than the slight tweaks to the graphics and a few minor touches, little has been altered in the third-person shooter gameplay, some of the environmental deaths make no sense given Rogue’s abilities, and the story hasn’t been expanded on. The action all takes place in a series of limited areas which restrict freedom of movement, which makes it feel outdated when compared to sandbox world games like more recent Elder Scrolls and GTA games. The levels are the same as 2006, the story is the same as 2006… basically, it’s the same game. Hopefully in the future there will be a proper new Rogue Trooper game with substantially more depth and scope to it, something more like Fallout 4 than a low-budget Metal Gear Solid 4. It’s certainly got the potential for it. The good news, however, is that the original Rogue Trooper game was a ludicrous amount of fun as you battled increasingly overwhelming odds. That fact is as true now as it was then, and while the first couple of levels throw you in at the deep end, once you’ve worked out the combat system you’ll be finding better ways to sneak around and perform more creative kills, including the always-hilarious sniping of your enemies’ oxygen tanks. Hit the tube and they die horribly and slowly but puncture the tank and the soldiers scramble in panic before it explodes. 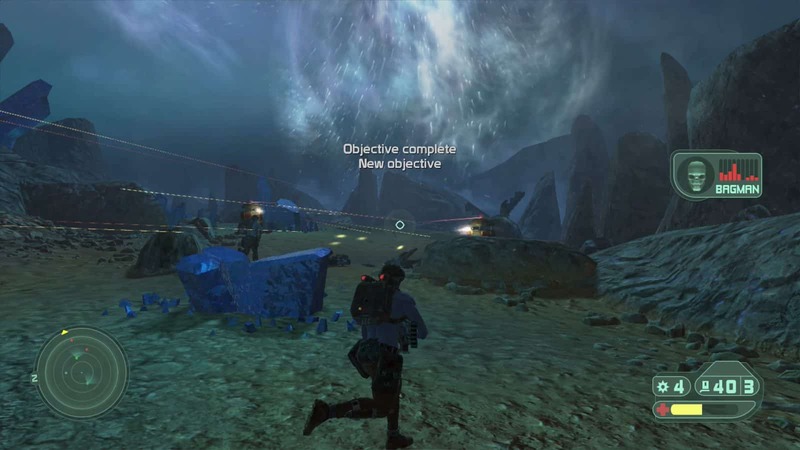 Rogue Trooper Redux isn’t perfect and it does feel dated, but it plays well, looks decent, has more levels than you’d imagine, contains plenty of action and gunplay, and is also less than half the price of most new games. Redux is a solid makeover of a perfectly serviceable game, and it’s a route that other companies should maybe consider following. Am I the only person wanting a “redux” of 2005’s Punisher game? 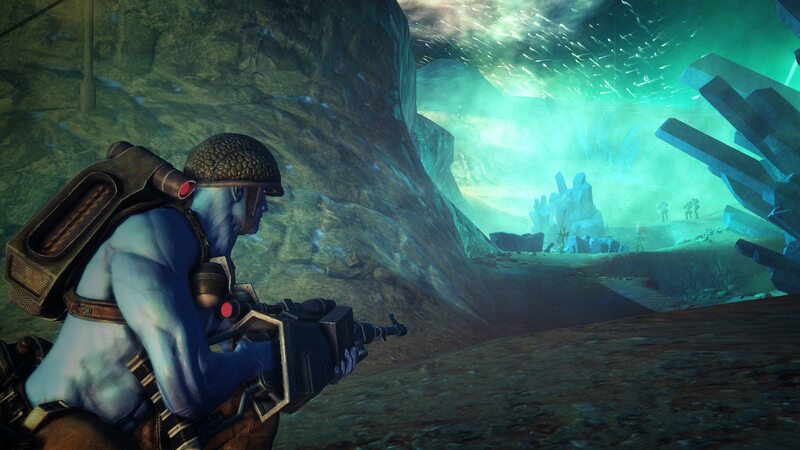 So if you liked the original 2006 game and have fond memories of it, happen to be a fan of the comics, or even if you just want an affordable TPS shooter that keeps you on a set path, then Rogue Trooper Redux could be the game for you.